Clifton’s Pacific Seas, 618 S. Olive St.
Long before kitschy was cool and themed restaurants like tiki bars, Planet Hollywoods and Rainforest Cafes existed, downtown Los Angeles sported eclectically decorated and festive Clifton’s Cafeterias. Over the top and lavishly theatrical, Clifton’s operated in Los Angeles’ heart, including Clifton’s Pacific Seas and Brookdale, one sporting an exotic, tropical setting and the other looking like a set from a national park. Even more remarkable than their lavishly decorated interiors was the generous, lovely operating philosophy behind the chain. From the beginning, Clifton’s operated on the policy of “the Golden Rule,” hoping to treat others as kindly as they themselves were treated. Clifford Clinton, son of missionary Edmond Clinton, was born in China while his parents served the poor after the Boxer Rebellion. Seeing the hungry and homeless, his deep compassion filled him with a desire to take care of those less unfortunate. His father later operated a chain of restaurants called Dennets in San Francisco, which he bought into with partners. Disagreeing with their business practices, he sold his share and moved his family to Los Angeles in the heart of the Great Depression. Clinton felt that a cafeteria geared to the working population would fill a need for good and filling food. Naming his restaurant Clifton’s, from combining parts of his name, Clinton worked to better the lives of his patrons. He explained his philosophy in little brochures called “Food 4 Thot” and “In Your Service,” freely given away to customers, containing inspirational and touching anecdotes meant to uplift readers. 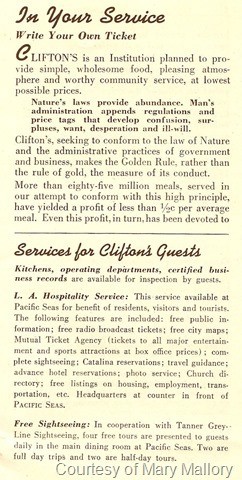 Clifton’s “In Your Service,” courtesy of Mary Mallory. As explained in a May 1, 1952, “In Your Service” pamphlet, its 105th printing, Clinton explained his principles. “Clifton’s is an Institution planned to provide simple, wholesome food, pleasing atmosphere and worthy community service, at lowest possible prices. The book went on to explain that Clinton had prepared an operations manual during his early association with the restaurant business in San Francisco, based on the principle of “the Golden Rule.” They opened at 618 S. Olive with this manual and $2,000 in 1931, but immediately experienced great testing of this application. For its day, the chain treated its employees fairly as well, establishing a “Bill of Rights” for associates. Employees received free and fair hearings before an associates’ board on disagreements and discharges; salaries equal to local industry standards; eight-hour days, a six-day work week; time and a half for overtime, paid vacations; discounts for family; group insurance; medical exams; free medical care and prescriptions; sick days; hospitalization; bonuses and other advancements. The cafeterias’ singers received the same salaries as other employees, along with monthly bonuses and opportunity for outside gigs. Julius Johnston, master organist at Pacific Seas, and Don Patrick at Brookdale served as directors and also provided instructors to improve the singers. The cafeterias also offered free space for group meetings; individuals with personal problems could consult with Jean, Donald or Edmond Clinton, the managers, or any staff member; birthday and anniversary cakes with decorations; “Food-for-Thot” pamphlets; Exchange Services where guests could post wants and needs regarding housing, real estate or personal items for sale or trade, transportation, finding lost friends, and the like; nutrition services; natural foods; low-cost foods; music and entertainment; amateur nights, community sings, and other fun events; air conditioning; family services; “MPF” (multi-purpose food); and Arts and Crafts Center with keepsake photo and a card and gift shop; a restaurant management course; free sherbet at 3 p.m. from the Sherbet Volcano at Pacific Seas; Garden for Meditation; Little Chapel in the Redwoods; “Pet share,” sharing your leftover food with your pets; flowers for sale; and flower leis presented to women. The multi-purpose food was created in partnership with Caltech biochemist Dr. Harry Boorsook to create a low-cost food item to feed the world’s hungry, especially in famine areas, consisting of dry soybean cakes. Clinton established “Meals for Millions” to help train people to work with countries on becoming more self-sufficient, to research better food and growing methods, and to raise money to buy food. Clifton’s opened many branches over the years, but its great customer services began slowly disappearing, though the main restaurants’ gaily decorated atmosphere remained. In August 1960, the family sold the Olive Street location, which was torn down and converted into a parking lot. One by one, branches closed, until only Brookdale’s downtown remained. While Clifford Clinton’s great experiment in serving his fellow man basically failed, his Brookdale Cafeteria still survives. That restaurant was sold to nightclub impresario Andrew Meieran in 2010, who is still renovating the facility, but hopefully removing none of its charm and history. This entry was posted in Architecture, Food and Drink, Hollywood Heights, Mary Mallory and tagged architecture, food and drink, Hollywood Heights, Mary Mallory. Bookmark the permalink. Inspiring story! It’s hard to even imagine in today’s environment, that a place like Clifton’s could ever have existed when it did. Oh how our country has changed. I remember my parents taking us to Clifton’s downtown L.A. when we were just little kids. We loved Clifton’s! Speaking of a somewhat similar environment, who remembers the “Rain Room” (?) at the Ambassador Hotel on Wilshire Bl.? It had a tropical theme, booths/tables, (Indoors), under a bamboo roof and every 15 minutes or so, it dutifully rained a manufactured tropical downpour. We want to remember another “dining room” like it in San Francisco, at the Mark Hopkins or the Fairmont Hotel.